In the monuments of antiquity found throughout North America, in camp and village sites, graves, mounds, ruins, and scattered works of art, the origin and development of art in savage and barbaric life may be satisfactorily studied. 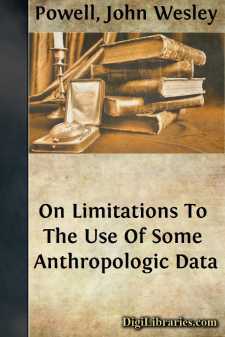 Incidentally, too, hints of customs may be discovered, but outside of this, the discoveries made have often been illegitimately used, especially for the purpose of connecting the tribes of North America with peoples or so-called races of antiquity in other portions of the world. A brief review of some conclusions that must be accepted in the present status of the science will exhibit the futility of these attempts. It is now an established fact that man was widely scattered over the earth at least as early as the beginning of the quaternary period, and, perhaps, in pliocene time. If we accept the conclusion that there is but one species of man, as species are now defined by biologists, we may reasonably conclude that the species has been dispersed from some common center, as the ability to successfully carry on the battle of life in all climes belongs only to a highly developed being; but this original home has not yet been ascertained with certainty, and when discovered, lines of migration therefrom cannot be mapped until the changes in the physical geography of the earth from that early time to the present have been discovered, and these must be settled upon purely geologic and paleontologic evidence. The migrations of mankind from that original home cannot be intelligently discussed until that home has been discovered, and, further, until the geology of the globe is so thoroughly known that the different phases of its geography can be presented. The dispersion of man must have been anterior to the development of any but the rudest arts. Since that time the surface of the earth has undergone many and important changes. All known camp and village sites, graves, mounds, and ruins belong to that portion of geologic time known as the present epoch, and are entirely subsequent to the period of the original dispersion as shown by geologic evidence. In the study of these antiquities, there has been much unnecessary speculation in respect to the relation existing between the people to whose existence they attest, and the tribes of Indians inhabiting the country during the historic period. It may be said that in the Pueblos discovered in the southwestern portion of the United States and farther south through Mexico and perhaps into Central America tribes are known having a culture quite as far advanced as any exhibited in the discovered ruins. In this respect, then, there is no need to search for an extra-limital origin through lost tribes for any art there exhibited.